Pottery, relief, 0.5L, figural inlaid lid (chalet). The centrally depicted shield, with its equilateral white cross on a red background, was formally adopted as a symbol of Switzerland in 1889, but had existed in a variety of similar forms as early as the 13th century. 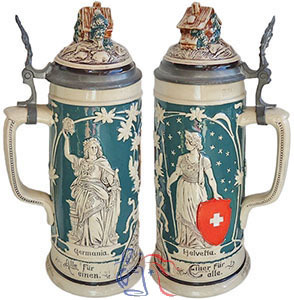 Between 1870 and 1914 Switzerland was a state in the German empire, represented by Germania (below left), an ancient symbol personifying the strength, unity and liberty of Germanic peoples. Helvetia (below right) is a national personification of Switzerland dating back to the 17th century.